This 2018 PRS SE 245 Electric Guitar w/ Gig Bag has been very gently owned and is in excellent condition with minimal wear. A few very light surface scratches and a tiny pressure dimple on its back can be detected upon close inspection. These imperfections are so minor that the up-close photos were overexposed to show detail. Overall super clean! Neck is straight as an arrow and frets show little to no wear! Looks, play sand sounds fantastic! We ask that you observe its pictures closely and invite you to contact us with any questions you may have. The SE 245 will cover all the tones you need in style and is the answer for players who grew up using short scale, single-cutaway guitars. The 24.5” scale length, Wide Fat neck is instantly comfortable, and the SE 245 "S" treble and bass humbuckers with dual volume and dual tone controls give the SE 245 a classic voice that is eminently recordable and gig ready. Bird inlays and the PRS SE signature logo design come standard. 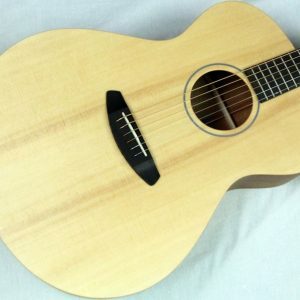 Width of Fretboard at the Body: 2 1/4"
Width of Fretboard at the Nut: 1 11/16"